Negeri Sembilan (Malay pronunciation: [ˈnəgəri səmbiˈlan]), one of Malaysia's thirteen states, lies on the western coast of Peninsular Malaysia, just south of Kuala Lumpur and borders Selangor on the north, Pahang in the east, and Malacca and Johor to the south. Unlike the hereditary monarchs of the other royal Malay states, the ruler of Negeri Sembilan is known as Yang di-Pertuan Besar instead of Sultan. The election of the Ruler is also unique. He is selected by the council of Undangswho lead the four biggest districts of Sungai Ujong, Jelebu, Johol, and Rembau, making it one of the more democratic monarchies. The capital of Negeri Sembilan is Seremban. The royal capital is Seri Menanti in the district of Kuala Pilah. 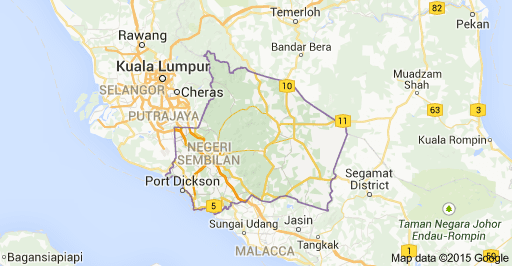 Other important towns are Port Dickson and Nilai. The ethnic composition in 2010 was:Malay (590,089 or 57.8%), Chinese (223,271 or 21.9%), Indian (146,214 or 14.3%), Others (3,583 or 0.35%) Non Citizens(57,907 or 5.7%).